Platinumlist is an event guide so uploading your event with us can do wonders to promote it even if you don't sell tickets with us. Once the event is uploaded you can choose or not choose to apply for ticketing services it’s completely up to you. Listing events with us has always been free and always will be. During event page creation process an organiser profile page will be created, where people can follow you as an organiser and be subscribed to your future events. The organiser page will contain your contact details and links to your social media pages. Make use of advanced ticketing functionality. Carefully optimised for high conversion and pleasant check out experience. Selling tables is a different ball game compared to tickets. Wealthy customers require more care and attention. And we have got the tools just for them. Customers convert better when you make them feel special. A small discount to select few can do wonders to lift your sales. Offer discounts or activate hidden seats with a promo code. Sell seasonal ticket at a discounted price. Are you organising an allocated seating event ? Our cutting edge vector based technology can help you manage up to 150,000 seats per event. We support multiple zone set ups where allocated and non allocated seating arrangements can be combined. Block seats at any time using organiser control panel or issue complimentary tickets. Allow users to pick their seats or enable auto seating mode. The system has gap protection to ensure there is no loss by left gaps. Do you require tickets to be sold directly from your website ? Our white label solution contains no logos or banner advertising. You simply place a buy button on your website, transaction takes place on our white label platform then redirects the customer back to your website. Do you need to set up a temporary activation at the mall selling tickets? Or simply need to sell tickets in your office ? Take full advantage of our sale console to generate tickets. Tickets arrive in customers email or can be printed on the spot. We are able to offer solutions for venues such as theaters and cinemas. Complete with box-office software and white label solutions for online and in person buying process. Our wealth of experience and innovation in this field can help your venue get set up in no time. 50% of event goers buy tickets on mobile devices. We take our mobile optimisation very seriously and we support all popular smartphones. Being in events marketing business for over 10 years we can help you market events efficiently. Reach out to over 500,000 platinumlist users via banners with cutting edge targeting tools. Or reach out via email, sms or whats app. Our social media specialists can take care of your Google Adwords, Facebook, Snapchat, Adroll and Google Display network and Youtube. Once your event page is set up. The organiser control panel gives the full access to all aspects of your event. Manage event info, start stop sales, view reports, manage guest list, block seats, view entry reports, and upload videos. Reports console gets data fromGoogle Analyticsand combines with sales statistics to give you detailed reports. It shows the trend of sales, page visits and conversions age groups, device types and customer origin. Use our tracking manager and create multiple unique links that lead the event page. Such links can be distributed to channels of advertising such as emails, banners and social media. Each link tracks traffic and conversions and can be compared graphically on the chart to see what works best. Need more advanced statistics? We support tags from Google Adwords, Adroll, Facebook Tracking pixel and Google Analytics. Many customers prefer to buy tickets over the phone. Our call center accepts credit cards over the phone securely. Our customer care assist ticket buyers with the purchase and entry process. We take support very seriously. Every enquiry is turned into a support ticket, not one is missed and we have strict timelines to attend the request. We scan all facebook and twitter accounts for customer support queries. Selling tickets with Platinumlist comes with benefits. Your tickets become available in our outlet network in 1000’s of stores worldwide. With our partnership programme we are opening new outlets all the time. Are you interested in becoming our partner? If you need to print your tickets in an oldschool way, we can help. 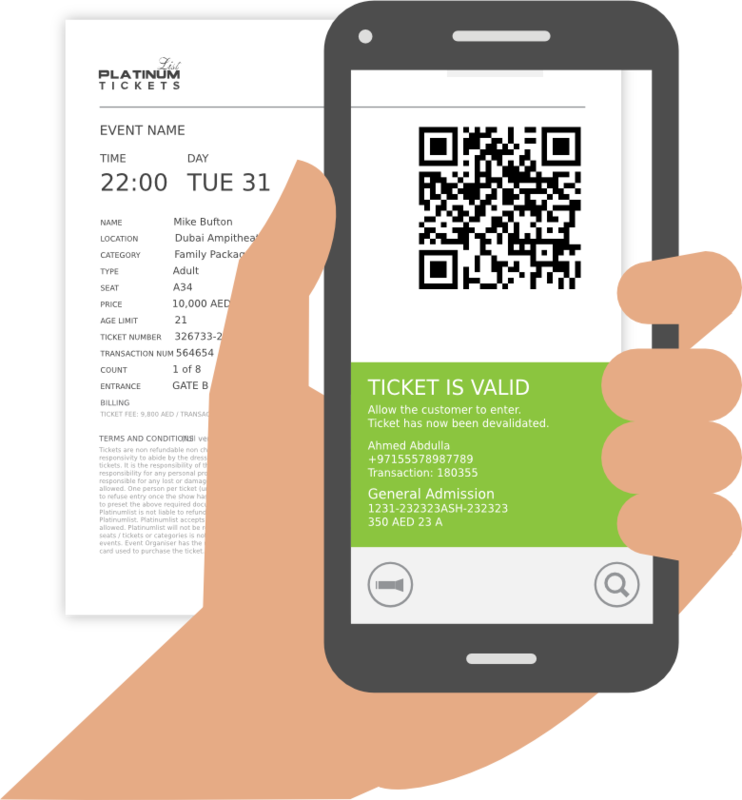 Each ticket contains a bar code which can scanned with our free IOS Access control App. 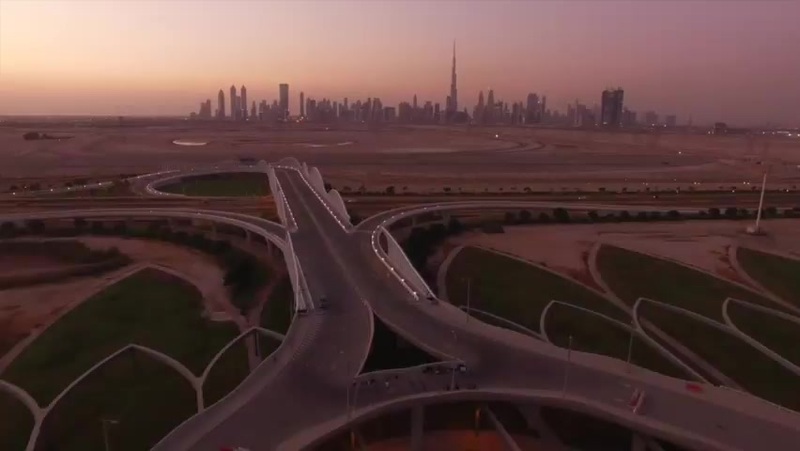 Events in Dubai would contain a DTCM bar code. Don’t have the time to organise door staff and cash sales at the event ? We have a dedicated team that can manage all aspects of ticketing at the event including cash sales, POS sales, customer support. We can deal with complaints at the door and make sure your cash is safe in a crowded environment. We have experience with high crowd fow and tested technologies to withstand up to 150,000 people per event. Simply fll in your bank details in your organiser panel and funds will be transferred to your bank account just a few days after the event. Prefer to get paid the old fashioned way via cheque no problem. We can also transfer your payment via paypal. It is very important to know what your customers think of your events. It can help you improve the operation and know exactly what customers think. Our free feedback system sends emails to all customers post event and delivers feedback to your dash-board live along with comments. You can even contact customers for further investigation. Platinumlist charges 3 % fee + 3% that goes towards credit card fees or partner outlets. Listing events and guest list service is free and will always be free. We know how important it is to accept as many types of payment as possible. That is why we accept them all Visa, MasterCard, American Express and PayPal. The sooner you start, the more tickets you sell.